Master Bath Vanity - Transitional - Bathroom - Philadelphia - by Patricia Gorman Associates, Inc. The vision for this project was to create one bathroom suite consisting of his and her private rooms, joined together by a large steam shower. Both baths are outfitted with radiant floor heat, custom lighting control system - which allows the homeowners to set different moods & task lighting, as well as motion-lights placed underneath each vanity for evening illumination and custom sound system. 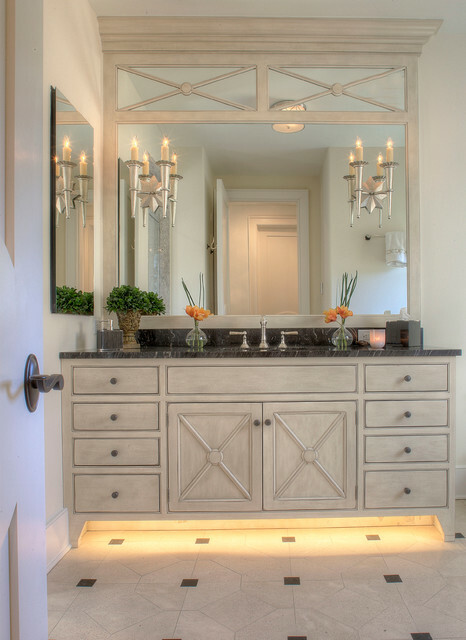 European lighting and plumbing fixtures, in connection with the finish palette and custom designed cabinetry, provide a timeless look. The darker slabs for the vanity top and tub surround provide a complimenting contrast to otherwise cream colored tones. Diagonal shapes in the vanity door and drawer profiles are repeated on a custom mirror surround. Central to her bathroom is the soaking tub featuring a cantileered shelf providing space for candles & toiletries and perfect views to relax & watch TV. Alongside the tub is access to a private quiet patio with waterfalls and custom outdoor shower, creating the ultimate spa experience in the privacy of your own home.